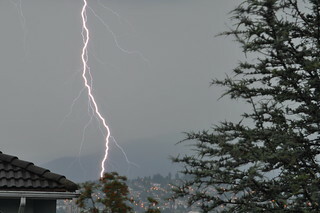 This is not the lightning bolt that struck my building. But I’m sure it looked something like this. I was at a conference on Friday in Vancouver and apparently while I was there, the apocalypse happened in New West. There was torrential rain, hail, rivers of blood, plagues of locusts, and lightning struck my building. Ok, maybe the rivers were just made of rain and there weren’t any actual locusts, but lightning did, in fact, strike my building. And apparently that killed our building’s transformer1, so they had to bring in a generator, which will power the building until they can bring in a portable transformer, which will get us through until they can fix the building’s transformer, which is expected to take 10 weeks. Ten weeks! Fingers crossed that the strata’s insurance will cover all of this! The power ended up being out for about 12 hours on Friday, so when I got home from the post-conference dinner, I met up with Scott at Waves, as he had an assignment due at midnight and Waves has free wifi, lots of access to electrical outlets, and lets you sit there pretty much forever. When they closed at 10 pm, we went over to the pub2. By about 11 pm I was too tired to stay up anymore3 and it occurred to me that I didn’t actually need electricity to go to sleep. As I was brushing my teeth by the light of a flashlight, the power came on! 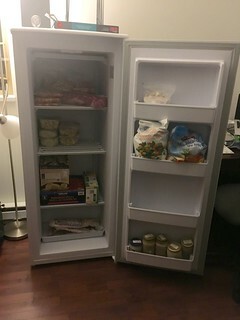 Just a few weeks ago, I had bought a stand up freezer, because I was sick of both having to be selective of what frozen foods I could have at any given time since the freezer at the top of my fridge isn’t very big and of having stuff fall out of my freezer at the top of my fridge every time I opened it. So I bought this lovely appliance, and filled it up with a whole bunch of frozen meats and vegetables, homemade veggie stock, homemade waffles, fish that Scott’s dad caught on his most recent fishing excursion, etc. So of course I was worried that 12 hours of no power was going to have ruined all that food. But lo and behold, this thing must be super well insulated, as after the power came on I opened it up to survey the damage and everything was still frozen solid! Yesterday afternoon, the power went off again! I had just gotten home from having been out most of the day and was going to try to fix the wifi, which wasn’t working since the first power outage, and the power to the whole building went out again! We got a letter from the strata later telling everyone that the generator they have running cannot provide enough power for everyone to do all the same things they are able to do under normal circumstances, so we need to minimize our electricity use. So don’t, for example, do laundry while cooking dinner and, if possible, cook dinner outside of the peak hours of 4-7 pm. And maybe turn off the lights when you aren’t in a room. Most of this (other than the not eating dinner between 4-7 pm) is stuff we really should be doing anyway, when you think about it, so I’m going to use this as a way of getting myself into the habit of being more energy conscious! Image Credit: I did a search for a Creative Commons-licensed photo of a lightning bolt on Flickr and one of the first ones to pop up was the above photo, which was taken by Derek Miller. You may recall Derek from his final blog posting. It’s really an incredibly cool photo!